St. Thomas’ Church is not open everyday. If you wish to see St. Thomas’ please contact the parish office to arrange for it to be opened. It was the eldest son, Robert Evelyn Roy who was the prime mover in getting Skirbeck Quarter the church they had dreamed of having for many, many years.There was no burial ground and all burials still took place at St Nicholas. 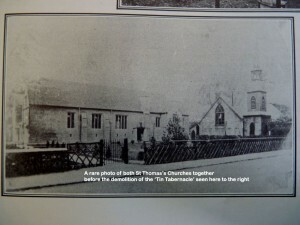 A rare photograph of both St. Thomas’ Churches together before the destruction of the ‘Tin Tabernacle’ seen here to the right. As the Quarter had no church of its own, St Nicholas was, for centuries, the Mother Church to the small but growing community to the south west of the Haven waterway. The long journey to the Mother Church was made by road or by one of the two ferries which eventually operated from the Quarter. With an increasing population the need for a church in the Quarter became pressing and certain eminent gentlemen came together to fulfil that need. 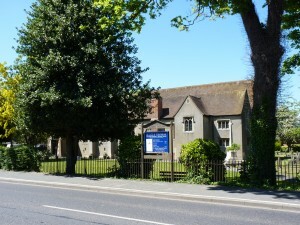 The first church was erected on land loaned by Mr J J Jebb and abutting the road on the area which is now the Church hall car park. The outer walls of this towered structure consisted of corrugated metal sheets. It became known as ‘The Tin Tabernacle’. It cost around £450, took eight or nine weeks to build and was opened on April 23rd 1885 by Bishop Edward Trollope. It had a guaranteed life of fifteen years but it was used continually for 27 years, until it became unsound and was leaking badly. A new, permanent church was required urgently. The appointment of Rev’d Albert Lombardini in 1909 saw the beginning of serious fundraising and it was on the day of 1st June 1911 that saw the good Reverend dig the symbolic first sod of earth for the building of a permanent church to begin. The church was consecrated and opened on the 9th May 1912 by Bishop Frederick Hicks. The robing of the Bishop and his entourage took place in the Tin Tabernacle, where earlier in the day communion had been celebrated; the very last service in a church that had served the community well. There was joy tinged with sadness in the community on that day as many remembered the old church with much affection.